Did you ever want to sit in a multiplayer game of Magic the Gathering and have a way to defend yourself regardless of the scenario? Did you want an entire deck to represent a shield to keep your enemies at bay while you planned a strategy to overtake them all in your goal of conquest? Did you ever have this really bad rash on your leg that you just kept scratching? Well, then you should go see a doctor before getting back to this shiny new decklist. Wall of Denial is "the" choice for defense. It laughs at those that try to ram through it and spot removal is wasted on it. It wanted a pal to go along with it so I began my search. 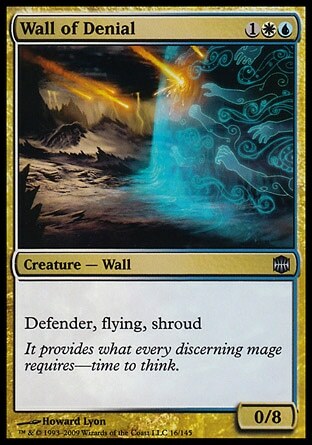 If there was a Wall that could search or bring back Enchantments then Mnemonic Wall wouldn't be here but for now, it is rather handy to bring back Jace's Ingenuity, Austere Command, or Hindering Light for a second party. Let's talk about those last though. They round out the package. If you're big on multiplayer and you didn't know about Sun Droplet, you should take a look right now. This thing is a life saver. Not the candy but it is rather sweet. The key here is that it's effect goes off EVERY upkeep. Take a look at Palliation Accord. Seriously. You might not realize how insane that card is in multiplayer until you test it out. By themselves they work miracles but combined together they will prevent most enemy forces from ever doing you harm. Ghostly Prison stops giant armies from swinging at you at all. 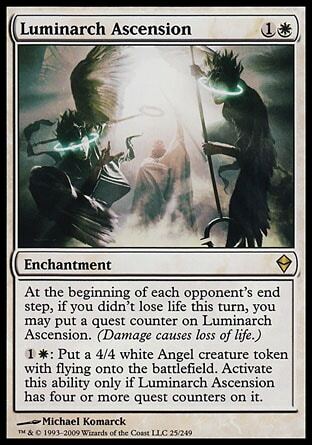 Leyline of Sanctity prevents quite the number of combo decks from ruining your day and any burn, discard, mill, or other nasty effect that might come your way. Prahv, Spires of Order can even help stop the big guns your opponents might try to sling at you. Pride of the Clouds gets its own paragraph. That's right. It can make flying tokens for you every turn and then you can plop it down to be a massive and evasive Mufasa (Lion in the clouds joke *nudge nudge*). It gets a bonus for every flier on the field, not just yours, so this kitty is going to be intense! Not only does this one card alone provide so many combat tactics but the other reason it needs its own paragraph is that it is easily replaceable. Maybe you prefer Windreaver? Maybe you prefer a Planeswalker as one of your win conditions? Either way, that's fine. Pride of the Clouds is cheap and effective so he's in my list but there are things out there that are possibly better against your group. It appears that the giant floating card above combined with the process of elimination have given away what I shall be talking about next. Luminarch Ascension is already scary in multiplayer due to how long people usually take to setup. This deck pushes it over the top. You rarely take damage as it is with all of your defenses and so this will be pumping out a giant army of fliers. Did I mention flying tokens? Why, yes I did. Pride of the Clouds will be very pleased. One last group to discuss. The instants and sorceries. I did mention I would talk about those last. Jace's Ingenuity doesn't need explanation. It's heavy card advantage at instant speed. Austere Command however is delicious in that it can take out almost any group of threats on the board. It's a Swiss army knife with tactical nukes people! Remember that most of your deck is made up of Enchantments so only choose that option in the right circumstance. Hindering Light seems like the perfect "defensive" counterspell to me. This deck is only concerned when something might target you or something you own so it's okay if that's the drawback when you've got this big of shield for a deck. Plus, it's a two mana counterspell that replaces itself. Can't forget that. So you've got defense for armies, single massive creatures, spells, and more. You've got walls, flying armies of your own, giant Mufasas, and more. Spot removal is useless against token armies and shroud. Mass removal barely makes you yawn between the token production and the sleeper land (Celestal Colonnade). Your Leyline lets you ignore most burn, discard, and mill. You're set for just about every scenario a deck could throw at you which is important at the multiplayer table. Mission complete! This deck is still a work in progress but for a first version, I think I've got something going here. Throw some comments down if you like it or if you actually got to play a version of it. Let me know. I'm interested as always. The same goes for ALL of my Decklist Ex Machina articles. This is Kylak signing out and making the Spartan shield look like a wet rag full of holes.